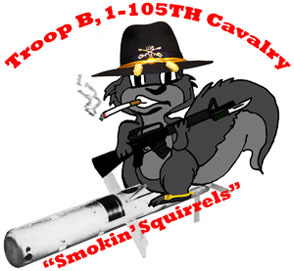 On 8 September 2007 we began our reorganization to Troop B, 1ST Squadron, 105TH Cavalry Regiment (RS). We were formerly Co. D, 2-128TH Infantry. Prior to that we were Co. E, 2-127TH Infantry. Troop B is a mounted Reconnaissance Troop of our Cavalry Squadron, the 1-105TH Cavalry (RS). Troop B is also known as "Bravo" Troop; "Bravo" stands for the letter "B" in the phonetic alphabet used by the military. Bravo Troop is one of four troops in our squadron; the other troops consist of a second mounted reconnaissance troop (Alpha), a dismounted reconnaissance troop (Charlie) and HHT (Headquarters and Headquarters Troop). This is the insignia of the 32D Infantry Brigade Combat Team. Our unit is part of the 32D Infantry Brigade Combat Team of the Wisconsin Army National Guard, the famous "Red Arrow." Check out the history section of the 32D "Red Arrow" Veteran Association web site to learn out more about the "Red Arrow." The Troopers in Bravo Troop are skilled and motivated. Our NCOs are dedicated and experienced. Our leaders are professional and qualified. For one weekend a month and two weeks a year we continue the proud, distinguished heritage of the 32D IBCT (formerly the 32D Infantry Division) and the Wisconsin Army National Guard. We are always eager to welcome new Troopers into the Bravo Troop Family. Explore the other pages of our web site so you can get a better idea of what we do. Make sure you check out our photo archive. Check out another page of our web site for more information about the opportunities and benefits available. Bravo Troop, 1-105TH Cavalry, is located in Watertown, Wisconsin. Watertown is situated in Jefferson County (part of it is in Dodge County too) in the southeastern part of the State. The Wisconsin National Guard and the City of Watertown have coexisted since 1851! Click on this photo, it is linked to another page of our web site that has more info about the history of the Wisconsin National Guard in Watertown. Visit the web site of the Watertown Historical Society for some interesting information and photos about Watertown's history.